Members of ACRATH (Australian Catholic Religious Against Trafficking in Humans) are spending this week in Canberra meeting with Members of Parliament, the staff of some embassies, the Australian Federal Police and staff of the Attorney General’s Office, advocating on behalf of trafficked people and young girls and women vulnerable to forced marriage. While in Canberra the group has been offered the kind hospitality of The Gathering Place, a spirituality centre with long and ongoing connections to the Brigidine Community. Brigidine Sisters are proud members and supporters of ACRATH and are invited to pray for all involved in this work of advocacy for justice. 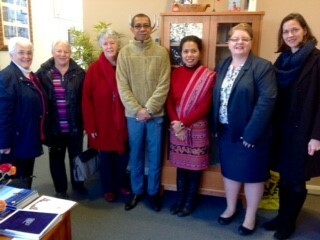 ACRATH members meeting staff of the Timor Leste Embassy.